A problem, or an opportunity for a new landscape paradigm? 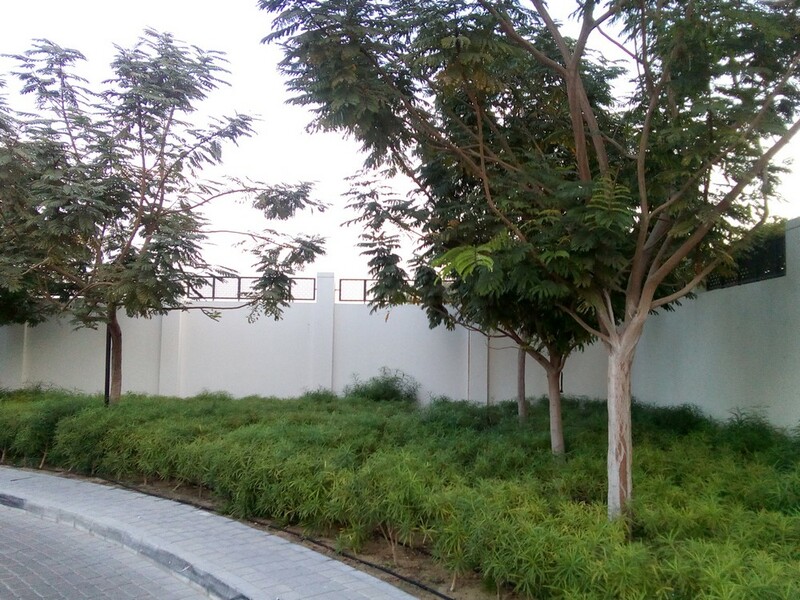 I was recently working on a tree project in Abu Dhabi when I came across a derelict site which intrigued me with it’s range of exotic self-seeded, non-native plants. 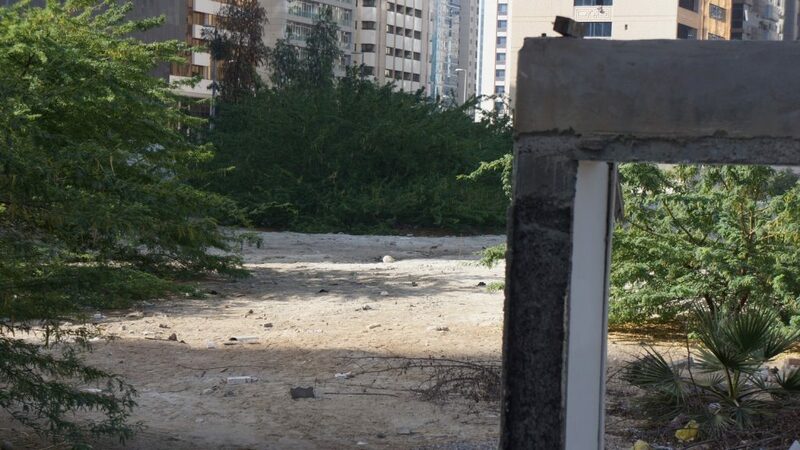 The site was next to the Corniche and sandwiched between the Formal Park, my hotel and Capital Gardens. It struck me initially as the perfect basis of a xeriscape, as all the plants (mostly trees) were thriving without irrigation. On closer inspection and identification of the species involved, things got more complex and raised a lot of potentially conflicting thoughts and issues. Of those plants, the P. juliflora was the most robust and when you look at its reputation, that is of no surprise. It was of landscape scale, lush and greener than anything in the adjacent parks. It’s form, leaf, flowers and seeds are attractive from a landscape perspective. 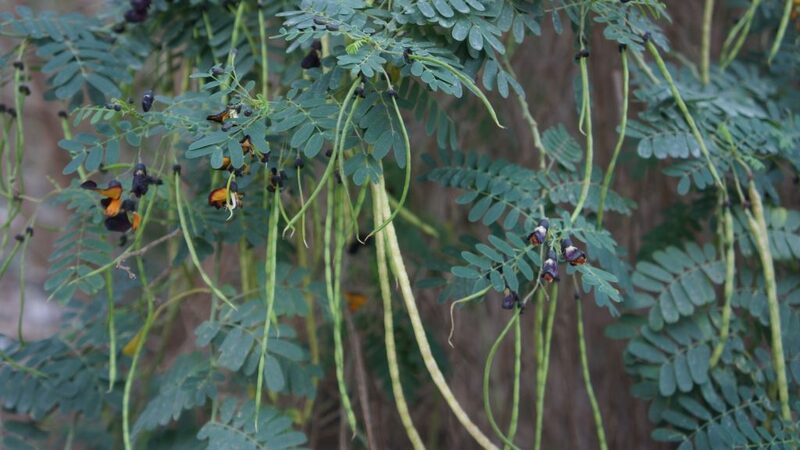 Yet this is undoubtedly the most controversial plant on this list – some would say alarming. 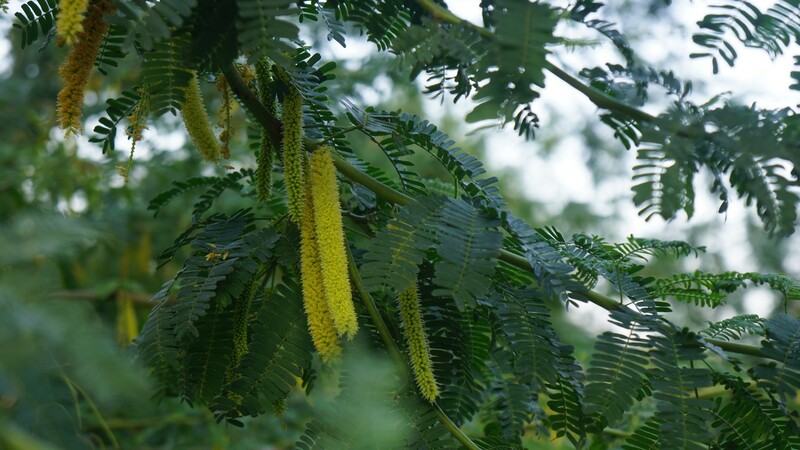 A Native of arid zones in central and South America, this was, like so many others, introduced into the UAE in the 70’s as a forestry plant. 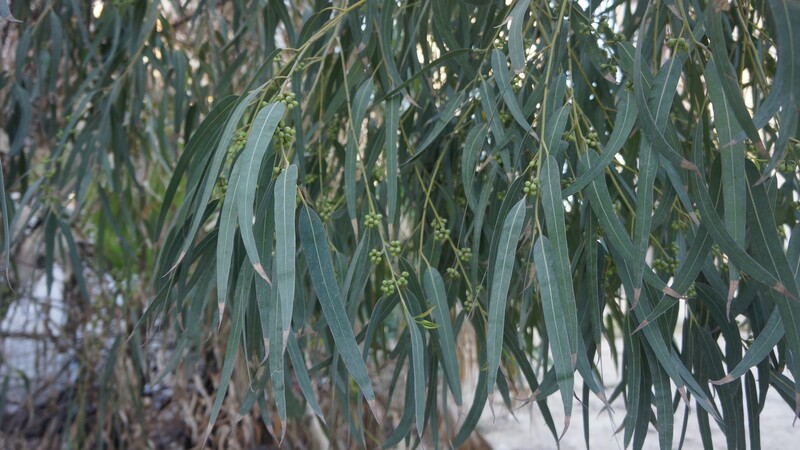 Lauded as something of a super-crop tree, it is tenacious, vigorous, provids fuelwood and stock-feed in the form of abundant seeds. The latter, it turned out, were a problem in that they are spread by cattle and are extremely aggressive. Plants also regenerate rapidly from the roots when cut back and they reputedly produce biochemical inhibitors to suppress competition (allelopathy). 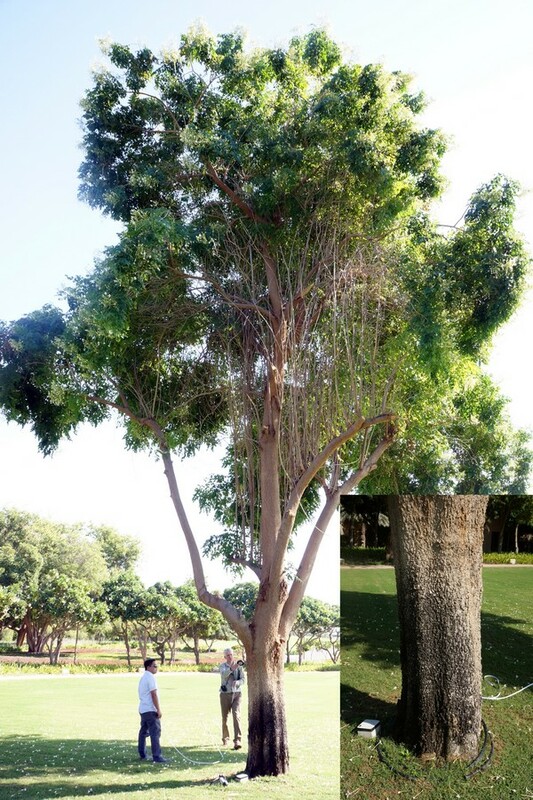 With no natural competitors in the UAE and roots that can descend 50m in search of water, they out-compete native flora, even their cousin, Prosopis cineraria (ghaf tree). P. juliflora has a low, mounding habit, attractive from a landscape point of view. Also on the site were a number of Banyan trees, Ficus benghalensis, which seemed to be growing happily. Another tough survivor, it should be borne in mind that the water table here is likely only a metre or so below ground, although it will have a high saline content. Then there was Eucalyptus glaucescens, another forestry/amenity introduction of the 70’s, also known and now generally avoided for its aggressive roots, yet here looking beautiful with its grey, lanceolate foliage. This was the tallest tree on site. 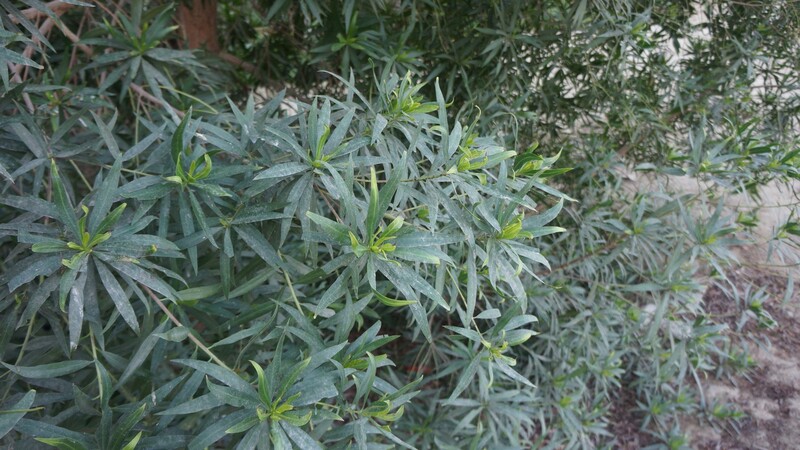 Of course, there was the ubiquitous Conocarpus lancifolius, widely planted still yet also recognised and a danger to any nearby drains, and on it’s way out in popular use. Except it does make such a good tall hedge, and it has a much nearer native origin, coming from Somalia, Djibouti and Yemen. 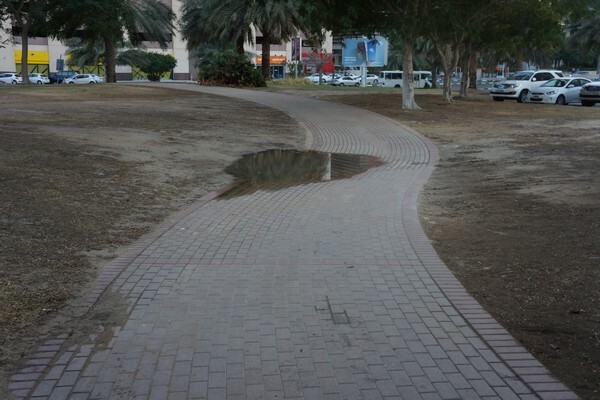 I’m not sure that the UAE landscape industry is ready to ditch it just yet. 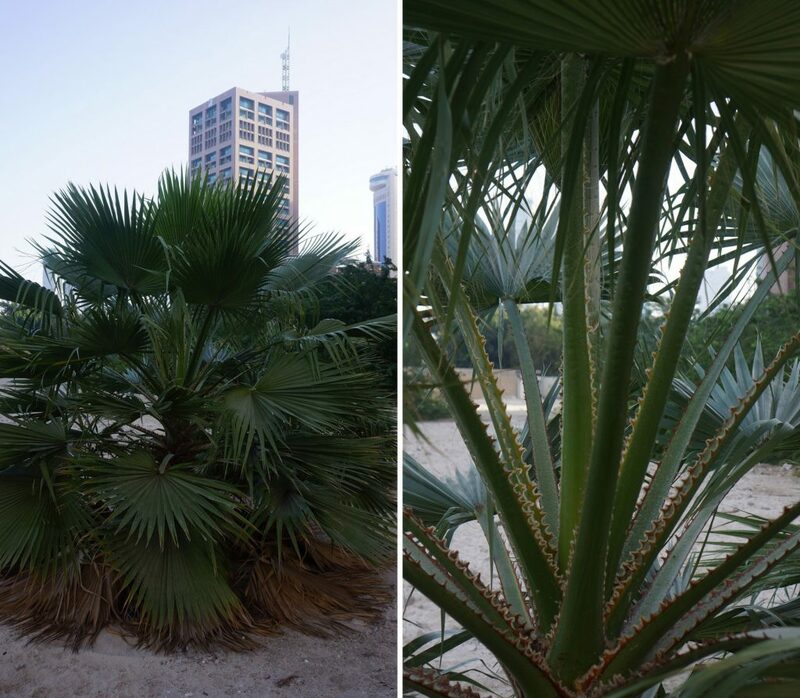 There was even a palm, Washingtonia robusta, self-seeded around the place. 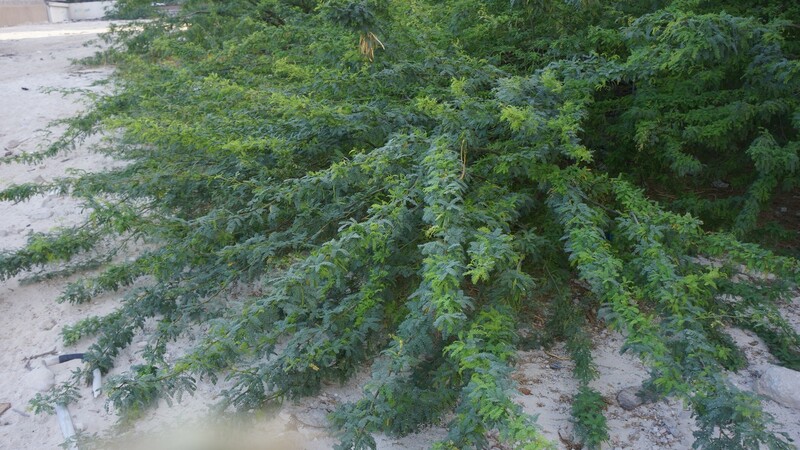 Much of it was to be found growing underneath the canopy of the P. juliflora, so that at least is not put off by any allelopathic biochemicals from the Prosopis. 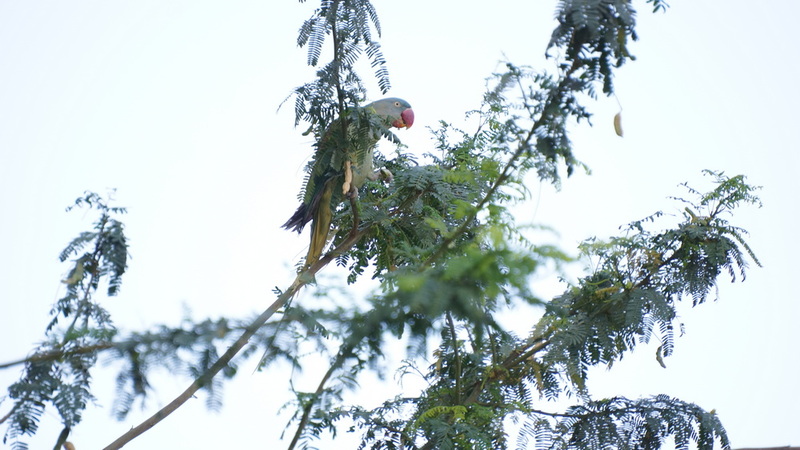 Inhabiting, or at least visiting the site, was a Rose-winged Parakeet. Another exotic invasive with beautiful form but aggressive tendencies; it seemed appropriate to the moment, somehow. What does this mean for future landscapes and ecology? From a conventional ecology point of view, these plants are all threats, and the threats probably outweigh their usefulness. So why am I even talking about this? Clearly, the move towards more naturalistic landscapes draws heavily on native species and would shun all of these species. Except we have climate change. Climate change is the elephant in the room, when it comes to ecology, in fact when it comes to sustainability generally and a livable planet overall. That we have already moved beyond vital tipping points is highly likely; that climate zones are moving away from the equator at a rate too fast for nature to adapt is a fact. Flora and even some fauna just can’t move regions that quickly. They will adapt, eventually; but those that are rare, specialist and struggle with change, will die. The tougher generalists will adapt and survive. Nature will build a new ecology to reflect the new reality, and it doesn’t mind if it takes a few thousand years to do so. Only we humans mind and so, if we are to survive, we must adapt our environments to fit the new reality. It is a sad fact that many cherished plants will eventually die out or move zones. In the UK, I dread losing our native oaks (I view these as our ghaf tree equivalent), yet we may get Mediterranean species to replace them, such as holm and cork oak. If you are already positioned in the arid equatorial zones then you have precious few plants that will form your new ecologies and landscapes. 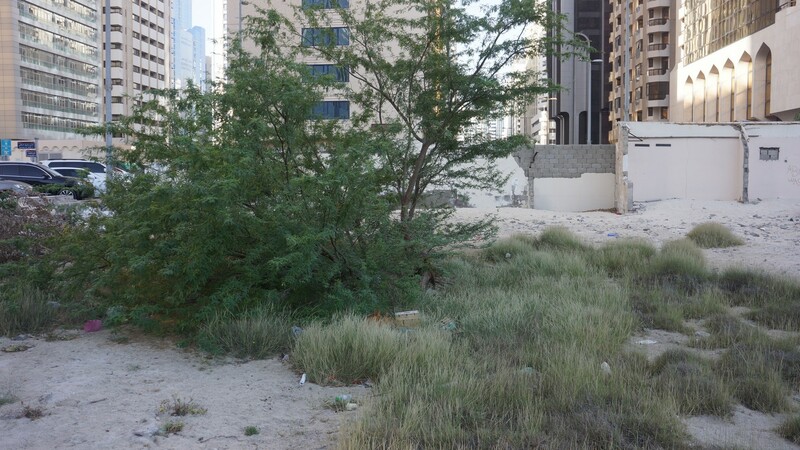 Perhaps the plants I have described above will be UAE naturalized-natives in 100 years’ time and the ghaf and sidr may be gone, or diminished, or moved north. I hope not, but before we spend vast fortunes on eradication and control of non-natives, we should look to the future. These aggressive invaders may just form the landscape of our children; I know I’d rather live with a landscape, than none at all. If there is no landscape, there is no life. They may, in fact, be here to save us. Once we grasp this fact, we can look at building new landscapes to suit our changing environments. I’ve written about this before and you can read the articles listed below. We must be vastly more holistic in our thinking in order to do this and broaden our horizons to understand the new future. Technology will help us to monitor, collect data and produce working strategies. Robotics and drones will help manage and control plant communities. Alongside that, we need a vastly better understanding of soils, microflora and fauna, for the bit of nature that we see is just, literally, the tip of the iceberg. The selection of tree and shrub species for adaptation is easy, we get this wrong when we don’t deal in whole context thinking eg. only thinking of forestry or ornamental benefits. The challenge ahead is huge but in a weird way, exciting; it will challenge the human race to grow. There’s a whole new science to develop and we’d best get on with it. On my most recent trip to Dubai, I enjoyed walking through some of the new landscapes that emerge as projects are completed. 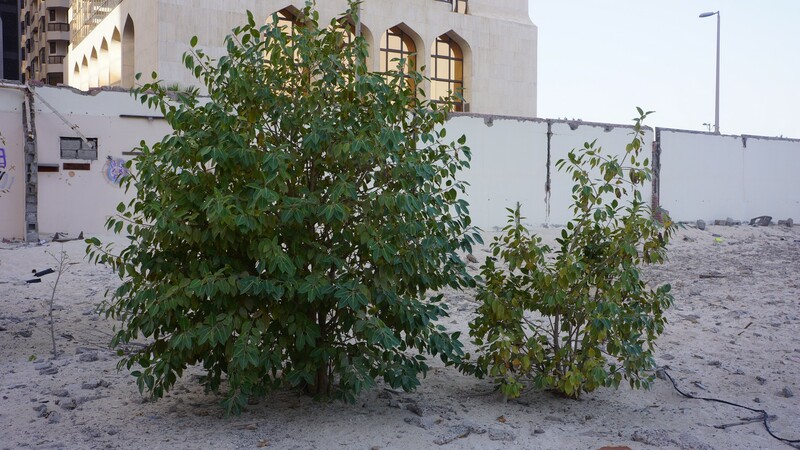 The UAE, along with most regions of the Middle-east has a rather limited palette of plants to work with (although that is growing as new plants are tried). What struck me, however, was how poor the quality of nursery stock was in some cases and what problems are being created for later, especially with regards trees. This is not new, nor confined to this part of the world but it bothers me that new areas of urban green are sometimes given a poor start with sub-standard nursery stock, often flown in from other parts of the world. 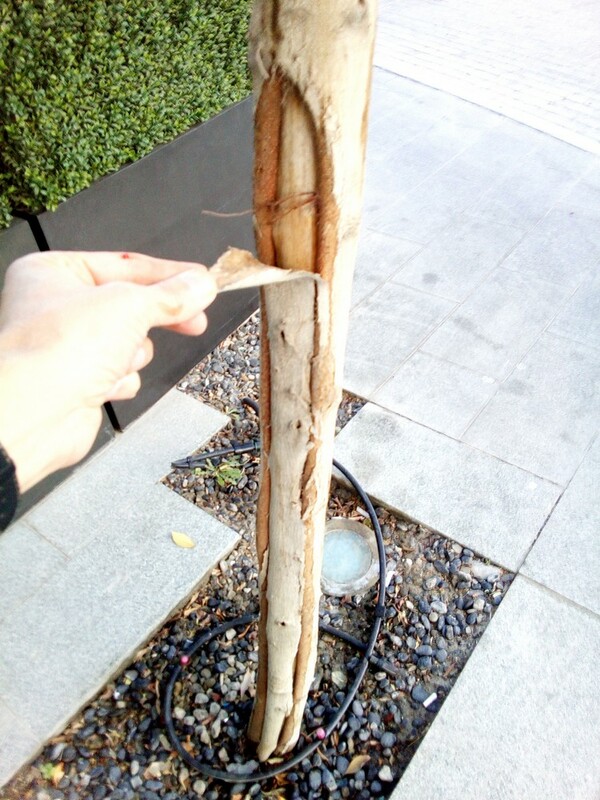 Simple pruning at an early stage would have improved this tree’s framework, removing crossing and rubbing branches. 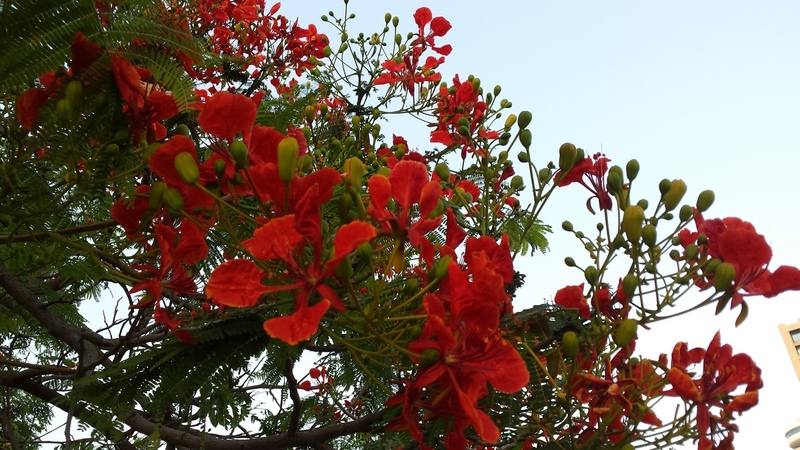 Wandering around a residential area in Jumeirah, I came across some newly planted Delonix regia, one of my favourite exotic trees. At first glance it looked nice, a simple planting of trees and groundcover but on closer inspection I was somewhat dismayed at the condition of the them. The problems of poor framework were caused by their time in the nursery, not due to planting, although some of them could have been rectified by a vigilant planting crew. 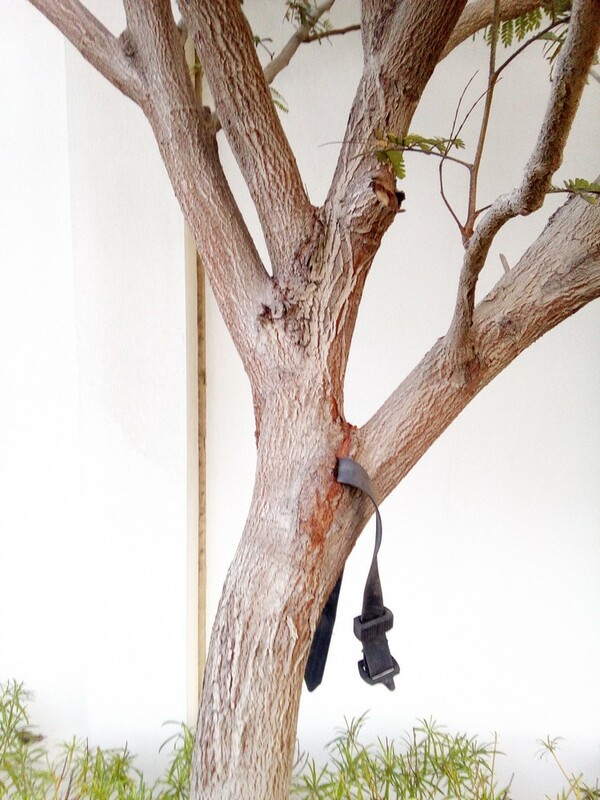 This tree tie – complete with post – must have been like this from the nursery. The post did not reach the ground. Many of the dozen or so trees had ties left on which the tree had grown around completely, making them impossible to remove. As the planting is only around two years old (by my estimation), these may have been on the trees from their time in the nursery. Possibly the planting was older and pre-dated the building they were attached to and the trees then grew around the ties after planting. Either way, it’s a strong indication of neglect or lack of care. In the picture below, all the bark ridge above the tie may indicate “included bark” – bark sandwiched against bark, preventing live tissue growth and a strong branch collar formation. 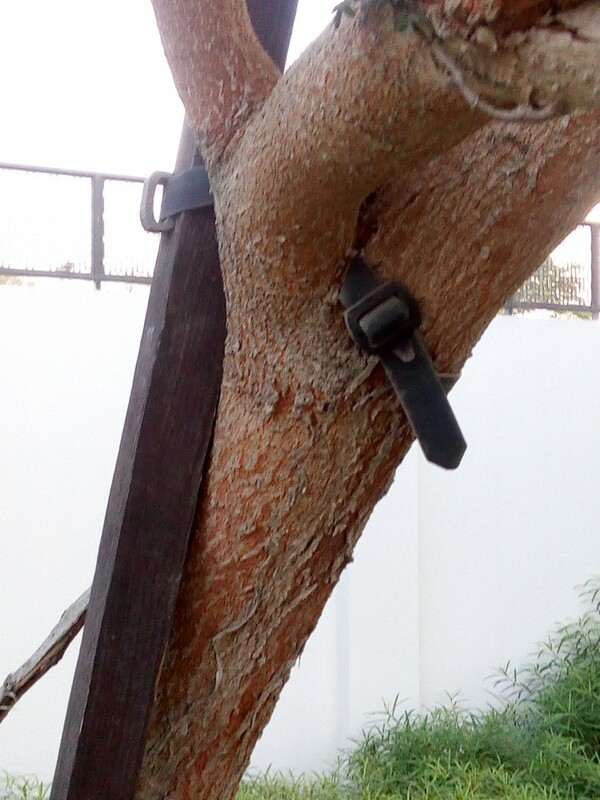 The tree tie is trapped with “included bark” at the branch collar, which indicates a potentially weak branch join. Several problems are arising here: pre-planting care in the form of correct formative pruning (five minutes with a pair of secateurs) and Post-planting care in terms of releasing planting ties – if they were not simply left over from the nursery days. If there is no way to go back and release the ties, a bio-degradable tie should have been used. This Ficus nigra was most likely damaged long before it was planted in this location. Damage to the main trunk or structural framework of a tree might go unnoticed when the trees are small but cause major problems as the tree gets older and puts on size and weight. 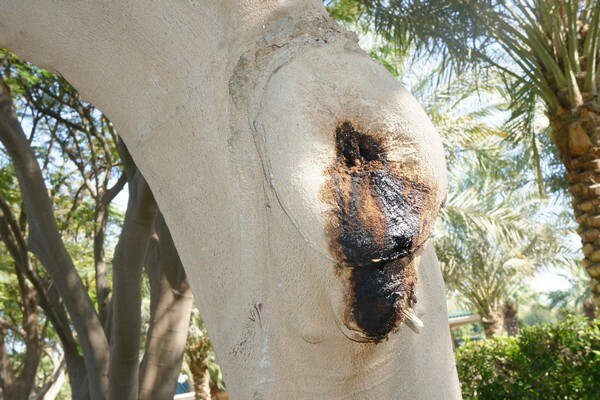 This can range from the cosmetic to the potentially dangerous in a large tree and at this stage the remedy is costly and the expertise hard to find. As fast-growing cities like Dubai mature, the needs of landscape shift from creation (in a hurry) to maintenance (at a constant pace). Skills, awareness of the need for – and absence – of skills, will become more and more urgent. 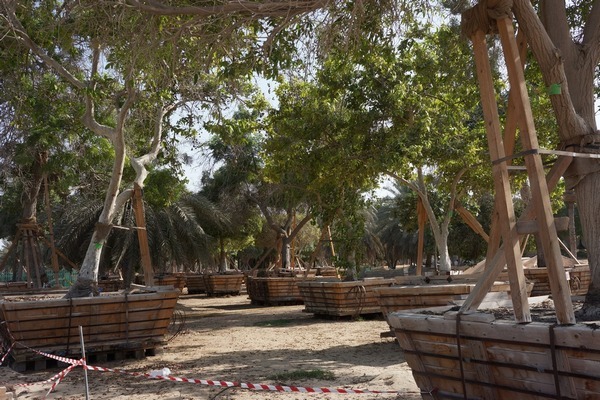 If Dubai wants to keep it’s beautiful, green mantle, then there is a whole new phase of arboricultural care awaiting to be discovered and initiated. 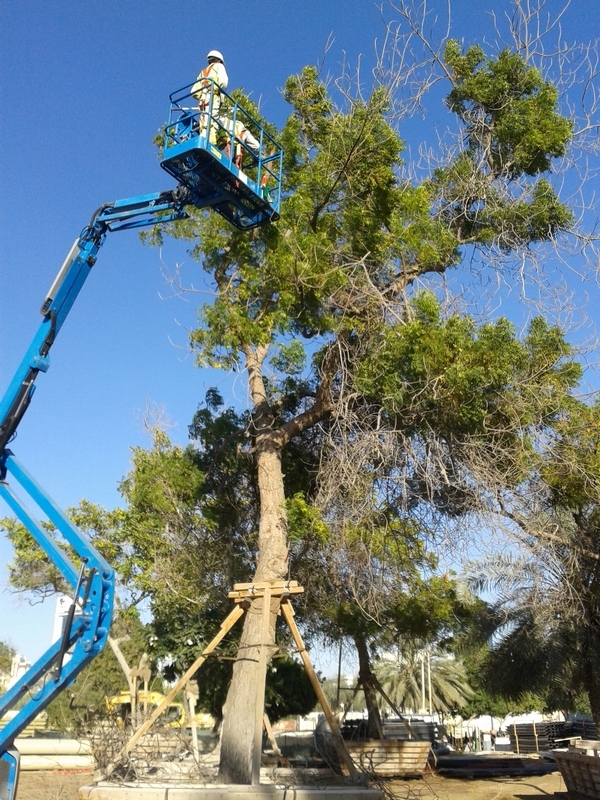 I have carried out trees assesments and given basic training of correct pruning methods in the UAE, but that has hardly scratched the surface; there is a lot more to be done. Trees are the urban, biophilic, blanket that clothe and surround the concrete mountains we build. Trees make hot places not just bearable, but unbelievably beautiful. Trees absorb dust, cool the air, add moisture and oxygen and enrich our Souls. We need to honour and look after them, so that they can look after us. 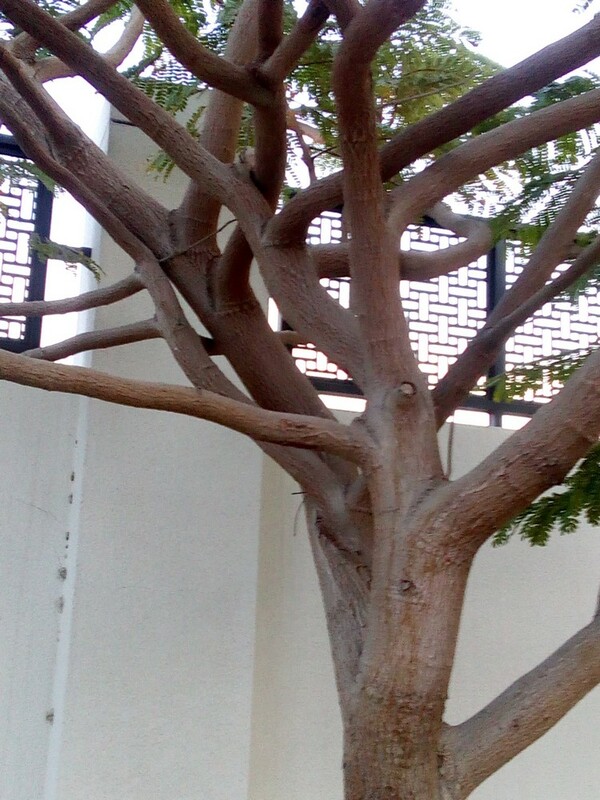 Last winter I did some interesting work in Abu Dhabi, concerning the care of trees. I can’t name one of the projects (a royal palace), but one was Mushrif Central Park undergoing a major redevelopment (and now reopened – March 2015). In both places I undertook a survey of 100+ broadleaf trees (as opposed to palms), assessed their condition and trained staff in basic arboricultural pruning techniques. 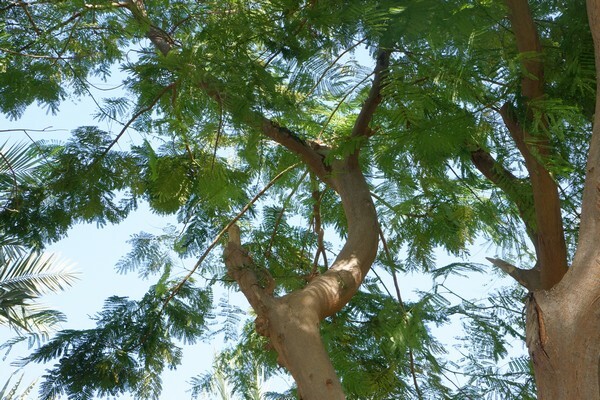 Such information is lacking out there as most such trees, with the exception of things like ghaf (Proposis cineraria) and acacia (A. tortilis) are imported from abroad, so knowledge of the necessary arboricultural techniques of pruning, especially of broadleaf trees, is generally absent (palms they are well used to dealing with). As you can see in the pics, the trees in the park had been “salvaged”, which is perhaps not a good word. A specialist tree-lifting company from the US had been engaged to train ground staff in the techniques of boxing and lifting the trees, no easy task in a pure sand soil and 35-40degC – and that’s the winter temperatures. I then had to attend to the care and aesthetics of the tree. My assessment was that most of the trees had been badly pruned in the past, causing poor crown developments and in some cases allowing disease to enter. Not surprisingly, some of the trees suffered severe shock in being lifted, but most survived, with varying degrees of die-back and then regrowth. Much of the work was simply about deadwooding and the teaching of correct pruning cuts and methods. Access is always the main issue and there was no way to teach the guys how to climb – that is a job for a specialist training school, so we were restricted to a cherry-picker and for the most part, hand tools. Many trees suffer, surprisingly perhaps, from over-irrigation. 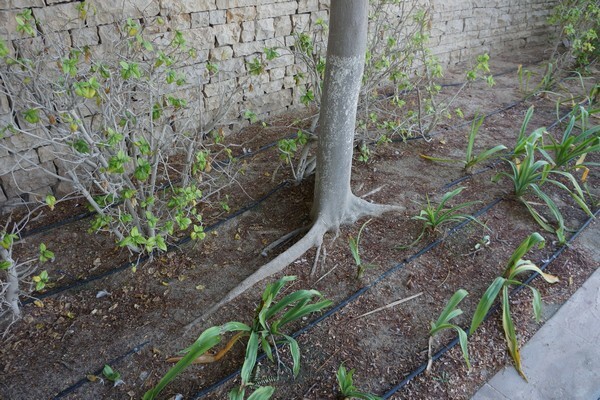 This causes surface rooting which makes trees dependent upon continued irrigation, plus natives like ghaf become prone to wind-throw from lack of deep anchor roots. 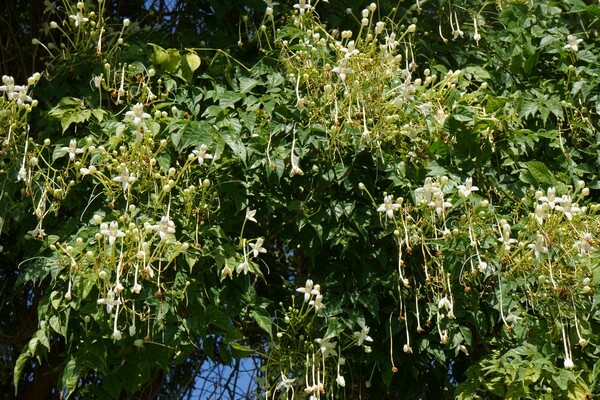 Exotic trees such as Delonix (below), grown for their beautiful red or yellow flowers, bloom less well when over-watered and become prone to bacterial wetwood infection. Places like Dubai and Abu Dhabi are developing at an astonishing speed and their landscapes are growing at a similar rate. Knowledge is the thing that lags behind, and it will take some time for this to catch up. I’m sure it will; there is something alluring about creating beautiful landscapes in a naturally hostile climate. This becomes a critical issue in the light of climate change and global urbanization, which is happening fastest in the hotter regions of the world; landscapes moderate climate and make such places livable, whilst biophilia demands that we need close contact with greenery in this urbanised world. 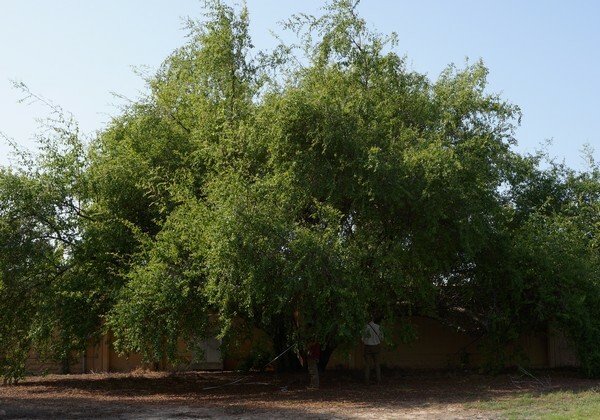 More needs to be done to increase the knowledge and care of trees, including species selection and nursery practice, reducing over-irrigation and teaching good pruning methods, but it can be done. I’m looking forward to the next phase. Is Azerbaijan the next Dubai? I’ve been reading several websites by visionary developers in Azerbaijan, who are proposing some massive Dubai-style developments to the Bay area of Baku, the country’s capital. One, the http://khazarislands.com/ seems like an ambitious Dubai-competitor, an ultra-sleek development on up to 30 artificial islands (think the Palm Jumeirah), the other is based on an existing island and whilst just as pretentious, http://www.ziraisland.com/ at least aims to generate all its own energy from renewables, and to be carbon-neutral. The buildings are all based on the forms of nine iconic mountains in the Caucasus Range. Actually, not a bad idea from the point of view of seismic safety and thermal efficiency etc. 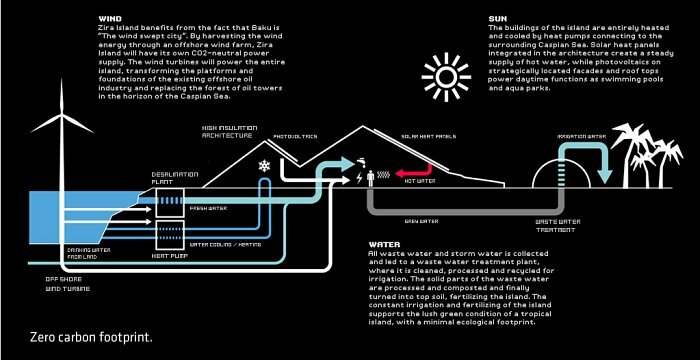 Serious plans to make a huge modern metropolis that is self-sufficient are rare, with perhaps only the Chinese actually trying this with some of their Eco-Cities. What is needed is to develop a coherent urban greening policy to integrate technologies like living walls and urban tree planting and care, with a carefully thought out irrigation policy. 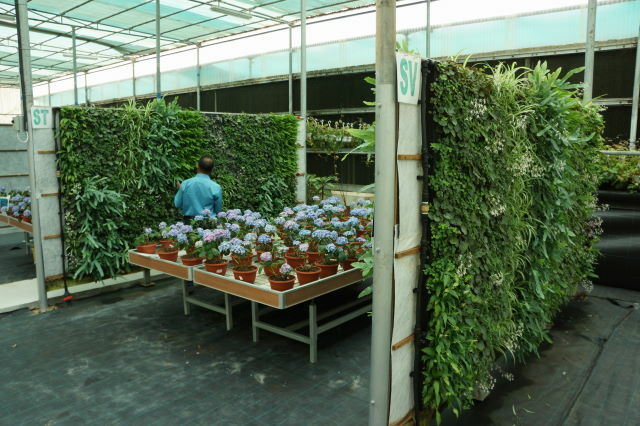 People still don’t see how essential green walls will be in integrating ecosystem services into a buildings basic functionality, but it will come. Let’s watch with interest. I’ve just come back from Dubai again, following up on the Biowall green wall installer, Acacia LLC. Indoors it is much the same conditions as anywhere in the world, but outdoors is a challenge. Temperatures in the hot summer months can reach 50°C (in the oasis town of Al Ain, it can get to 62°C, with low humidity). Finding plants that will cope with these levels of heat is not easy. We’ve had test walls going for nearly a year now, so about to have a second summer test. I have just set up a stage two trial, to run from September, testing an expanded range of 50 outdoor species, mostly plants used there as groundcover. This will be divided into sun and shade walls, for obvious reasons, and have a rigorous testing regime. 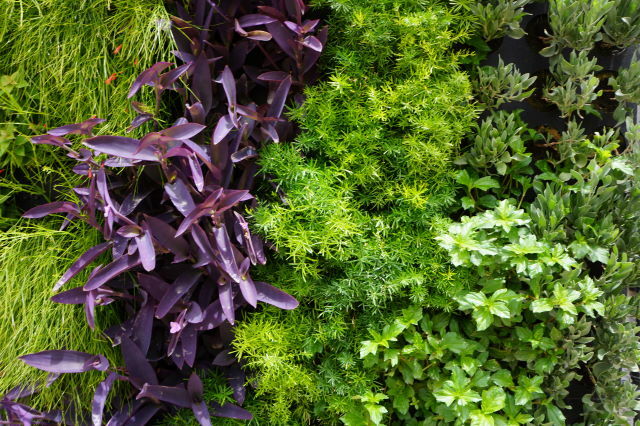 There are, of course, other people trying green walls. Both of the ones I have seen (outdoors) I fear are likely to fail. This is not good news, because UK experience tells us that a major public failure can set the whole industry back considerably, as it takes a lot of proving then to show that it can be done. 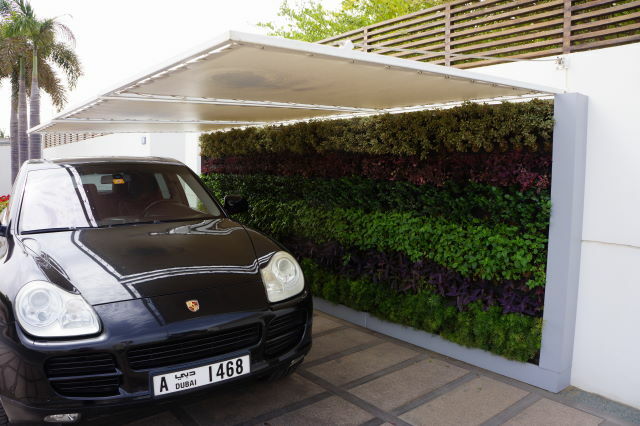 This is a brand-new wall on a new hotel using a compost pot system on the Sheikh Zayed Road. Plants are looking very poor already… since recovered but not that great. So walls like this one cause a lot of problems, which of course, will be corrected with time; the momentum out there for vertical greening is becoming unstoppable. 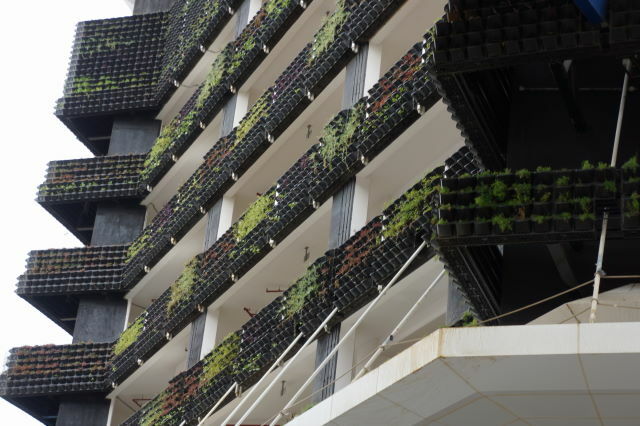 Systems like the one above that use individual pots to hold compost, mean the root zone is exposed on all sides to heat and wind; keeping such a plant well watered will be a tough call, especially when there is no drainage fitted and it just drips onto the building façade. 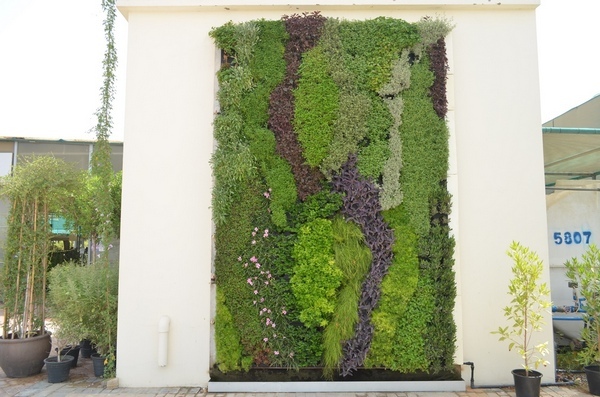 Biowall system outdoor living wall at Acacia’s garden centre.